Story telling area ‘s are always popular in school grounds. They can be as small or as large as you want, filling the smallest corner to creating a whole theme for the garden or outdoor space. 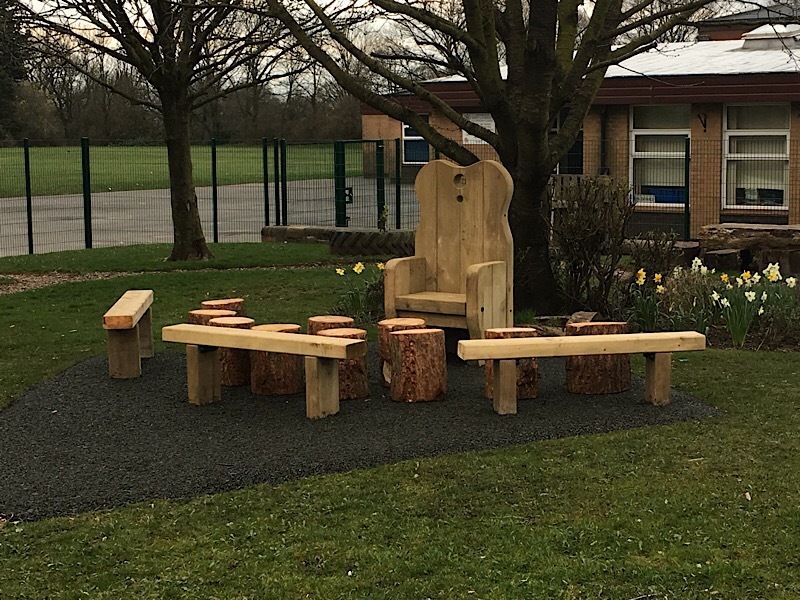 We like to combine the standard elements of the authors chair and fixed bench seating in the design of a Story Telling area, with a decent flooring that wont turn to mud, and a selection of moveable logs. Our Resibond surfacing is easy to lay and gives a rubber surface, free from mud, over existing grass. Some grass will grow through around the edges but it does blend in quite well. At this school we created a small area for reading and role play. The area is tidy and is a good focal point of activity at the front of the school.